Two Scotsman, Doak and Alexander MacLaggan arrived here in Blackville and built a sawmill in 1820. It was located on the north side of the Bartholomew River at the present site of the current bridge (that was completed in September, 1978). The motive power of this mill was a large undershot water wheel driving a set of gang saws, an edger, a cut off saw, lath machine and shingle machine. A slip from the up river end of the mill extended down into the water of the millpond. In the middle of this slip was an endless chain to haul up the logs. The man tending the slip has a number of short chains with a sharp dog on one end and a hook on the other. The dog was driven into the link of the endless chain. When logs were needed in the mill, a friction operated by a long lever, would cause the endless chain to move and thus hauling the logs up into the mills. The logs were rolled on trolleys which fed them into the gang saws. The boards and deals then went through the edger onto an elevated set of live rollers, which ran along the river bank at the lower end of the mill. A branch of the Canadian Eastern Railroad ran along by the side and beneath the run. The sawn lumber was caught as it passed along the run by a man with a pickeroon and slid over on to the various flatcars. With a good head of water the capacity of this mill was between five and six hundred logs in a ten hour day. Some times it was less. On the Flat below the mill was a long shed called the Shingles Shed. This was generally kept full of cedar shingles. Across from the sawmill (known as the Water Mill) somewhat below on the opposite side of the river, was a water driven Grist Mill operated by an old Englishman called Henry Steele, (the father of Mrs. Bob MacLaggan). The mill opened in the 1840’s and a large grinding stone of about five feet across. One can be seen in the old Anglican churchyard in Blackville. The farmers at this time, would plant their own wheat and then take it to the mill and have it grounded into flour. Many times they could hook up their teams and load the wheat and buckwheat and take some on down to Newcastle. There were only two employees at this mill. In the morning when the boys were on their way to school, Mr. Steele would give them each a handful of buckwheat to chew. This mill closed in 1902. Around 1893, Alexander Gibson from Nashwaak, took over the Water Mill from Doak and MacLaggan and he also built a Steam Mill. He also had a store and a warehouse. The high brick chimney built at this time for the Water Mill was the highest in New Brunswick by one tier (82 feet). This was torn down on June 24, 1978 much to the disappointment of the villagers. The first engineer of the Gibson Mill was Archibald Alcorn, Sr. who was also the first man to drive an engine on the C.N.R. line from Chatham to McGivney. Other managers were James Wilson, James Wetmore, Scot Farley, Cy Mckendrick and DeBrissay. All the lumber was hauled to Nashwaak. Gibson only came once a year. He was a short man with a long beard. He never missed his visits to the schools and on that day everyone would put on their Sunday clothes for “Boss Gibson”. He’d come across the schoolyard with a pocketful of shiney new dimes and distribute them individually to 60 or 70 students. He’d ask who you were and comment on how you resembled your mother or father. A steam engine for the Steam Mill was brought from Saint John where it is said it had been used to drive electric generators for electric lights in that city. It was a large slow speed engine, the balance or drive wheel being about ten feet in diameter with a face of three feet or over. Two large highly polished steel balls about ten inches in diameter, mounted on a pedestal were used for governing the engine, swinging upward or outward when the speed got too great and thus shutting off the steam and reducing the speed. As mentioned before, Archibald Alcorn Sr., a native of Kelso, Scotland was the first engineer. He was born in 1852 and died in 1914 and was married to Margery MacDonald. The first mill wright was a man by the name of McCully; the boss was Debrissay. Laths at 10 cents a bunch; wages at $1.00-$1.25 for a ten hour day. Young boys sometimes got as little as 50-60 cents a day. After some twenty years, around 1915, Gibson sold out to Nashwaak Pulp & Paper Company Limited. He took the railway as well as the mill. Archie Alcorn Jr. was the manager as well as the financier for this company. Many workers got paid as little as $1.00 – $1.25 per day. Davy Schofield was the boss for Mr. Alcorn. 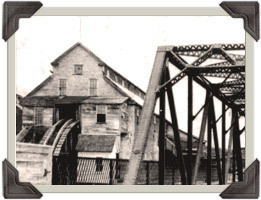 The mill operated for only a few years when it was destroyed by fire in 1931. All that remained was a fire proof boiler room and chimney. A few years later, the mill site was leased to Bamford Brothers from Doaktown who built and operated a mill for several years. In 1958, the timberland and the mill site of Nashwaak Pulp & Paper Company were acquired by the Miramichi Forest Products Limited. Part of the licence was sold to Clifford Cory to support a mill which they had built in Doaktown. Part of the freehold land and a small licence was also sold to these men to support a mill and pulpwood operation at Boiestown. The remainder of the land consisted of 90 square miles of licenced crownland and 2,000 acres of freehold timberland, which was retained to support the Blackville Mill. 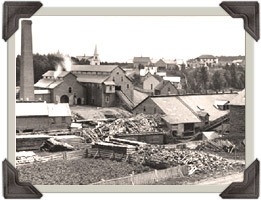 It is worthy of note that in the century long period, there were only four owners of the mill site, namely; MacLaggan, Gibson, Nashwaak Pulp & Paper Company Limited and Miramichi Forest Products. In 1973, the old mill burned and a new one was built in the upper part of Blackville. It was stared by Hugh John Flemming and came under the name of Flemming –Gibson. In October, 1975 the mill was finished. It had 150 employees working at the mill and 200 in the woods. Poor lumbering markets caused a shut down in many mills in New Brunswick and unfortunately the Blackville Mill also ceased to operate in February, 1977. It was later reopened as Blackville Lumber and operated until 2007.